There are contenders, and then there are the pretenders. I am a contender, I am the real deal. I know you are wondering what I am talking about. Well, I am talking about being a data dork. Yep, I am a naturally-born data dork that has the right brain wiring to claim the title. Real data dorks are born into the role. You cannot pretend to be one. Either you collect and love data or you don’t. One method you can use to find out if you are a true data dork is to look to your past. You might be a true data dork if you can find examples of your own data collection activities from a time long before the words analytics, data science, Tableau, dashboards, or any of the other commonly used buzzwords existed. If you can find these examples and document them like I am doing, this unequivocally proves that you possess the traits of a data dork. In this short story, I’ll give you proof of why I am the real deal. In this series of short stories, I will be able to show multiple examples of data-driven dorkiness. The reason for this is that I collected data and documented things in my life from the pre-computer era, when I only had dreams of electronically drawing charts and graphs. If you stick with me throughout this series, you will see what I mean. Now it is time to get to the story. There are a number of ancillary stories that go along with this one, but since this is a short story, I’ll get to the point. 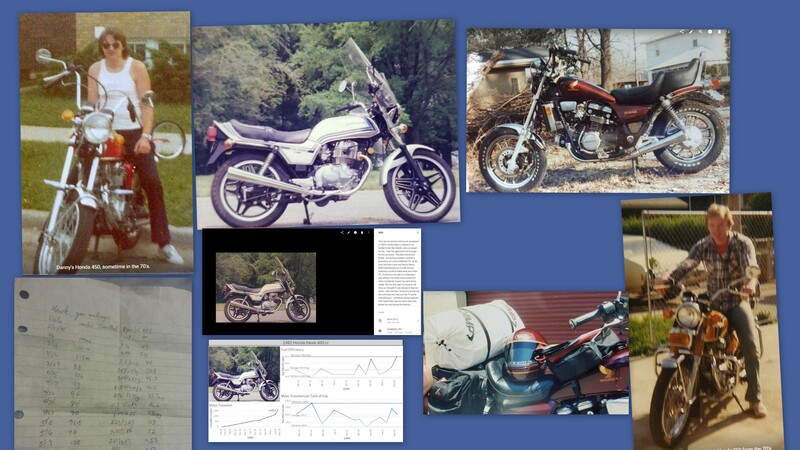 As shown in Figure 1, and documented on April 4, 2012, I bought a new motorcycle in 1983, with the help of my brother-in-law (see the text to the right of the picture). Please recognize that this was about 34 years ago already but it seems like a few minutes ago. Some memories are forever etched into our minds when they are deemed significant moments. Figure 1 – My new Honda Hawk 400 cc. Since money was tight in my college years, every cent mattered to me. 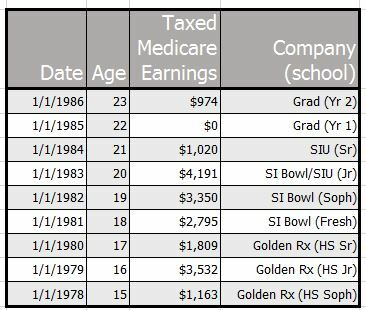 As shown in Figure 2, my income in 1985 was $0! Now you know why I had to ride my bike to Texas to see my friend! I just love being able to tie these stories together. 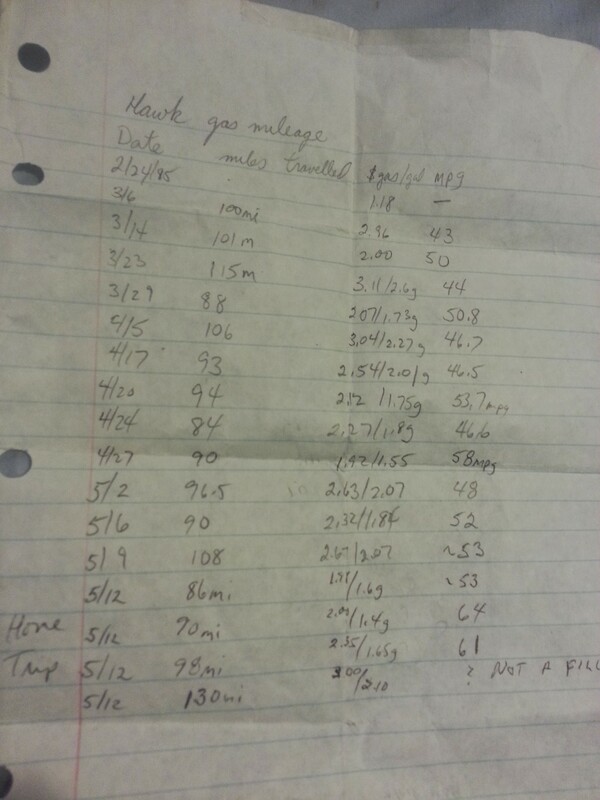 Figure 2 – My earnings during high school and college. I sure had to work a lot of hours for those dollars! For this reason, in 1985 I decided to document the fuel efficiency of this motorcycle! As shown in Figure 3, I recorded the gas consumption and miles driven. The fact that I still have this data record speaks volumes about my inherent data dork tendencies. 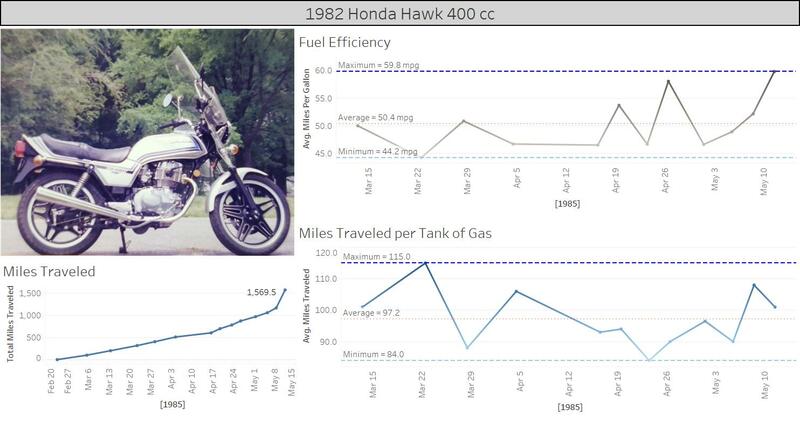 Figure 3 – The Honda Hawk performance record. Now I have used Tableau to analyze this data. As shown in Figure 4, the .4L engine obtained an average of just over 50 miles per gallon. Figure 4 – The Honda Hawk performance dashboard. 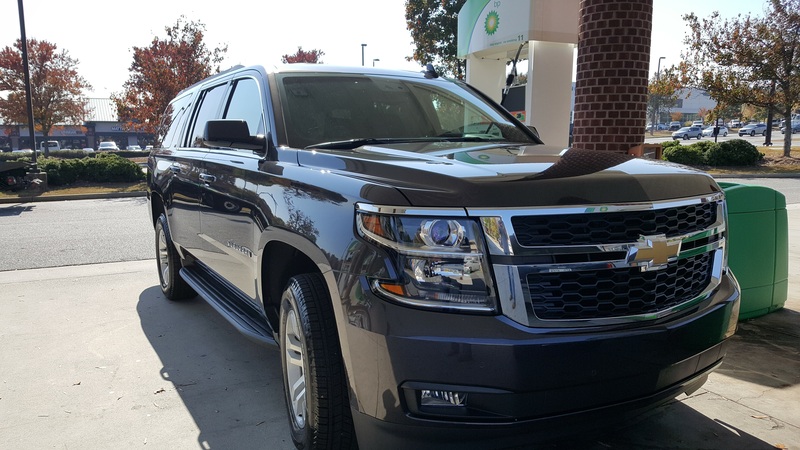 With a total weight of just 400 pounds, I’ve been thinking about how efficient that machine was compared to the 2017 Suburban I’m currently driving (Figure 5). I can’t help that my brain thinks this way. I have just learned to accept it, do the calculations, and move on down the line. Figure 5 – 2017 Chevy Suburban. Tableau was used to compare the vehicles as shown in Figure 6. 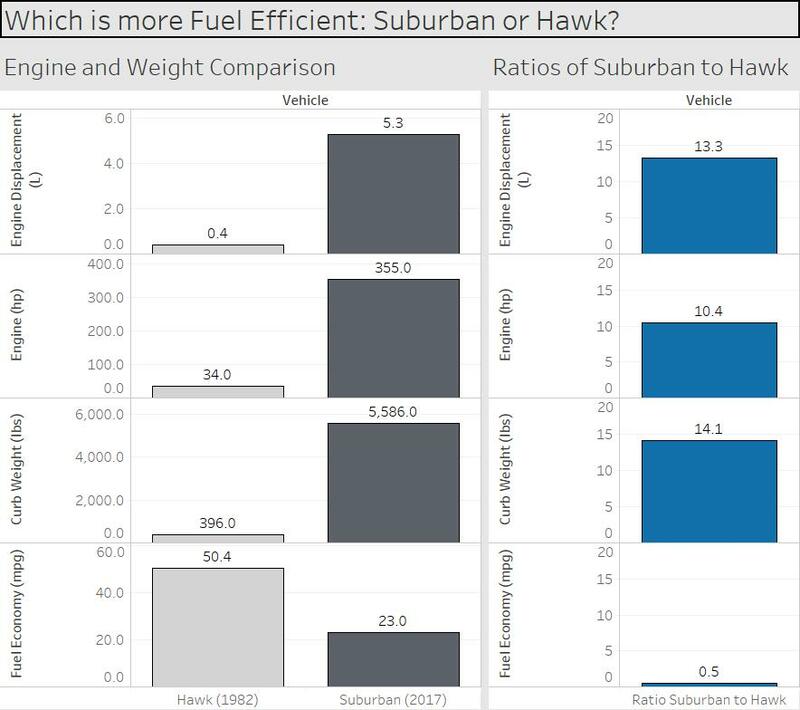 What surprised me is that although the Suburban Engine is 10X bigger and the vehicle weight is 14X more, the fuel efficiency of the Suburban is nearly about 1/2 that of the Hawk. This data indicates that the engineering continues to improve on the big SUVs such that even fully loaded with seven passengers and luggage, I have been able to achieve >21 mpg in this vehicle. Obviously, it is ridiculous to compare the performance of these two vehicles, but that is OK. When you are a data dork, nothing is off-limits! You might not be convinced of my data dork argument, especially since I only recorded the data for a few months. Well, more than a decade later, I did a multi-year study, with full data collection, on a 1996 Nissan Maxima that I had purchased. If you are interested in delving into the mind of a data dork, you can read a much more in-depth and detailed story about that study by clicking these links: Part 1 here and Part 2 here. It has been about 4 years since I wrote those. I just re-read part 1 and I had a few good laughs! Finally, I got my first motorcycle at age 14, when my Mom came home from work one day and said: “Would you like to have a motorcycle? My friend at work is selling one.” Well, my answer should have been predictable at age 14, and that gold Honda 350 is shown in the lower right corner of the collage below. My big brother Danny is also shown sitting on his Honda 450 from the 1970’s in the upper left corner. Therefore, Honda motorcycles were in my blood, just like loving data is in my blood. Thanks for reading the short story #2.